As the search for missing Malaysia Airlines Flight 370 enters its 12th day, investigators are focusing even more on chief pilot Zaharie Ahmad Shah. On Monday, it emerged that whoever altered the flight path likely did so by programming a computer in the plane's cockpit; now, it appears that the pilot deleted several files from a flight simulator he had in his home. Investigators have recovered the flight simulator from Shah's home. At a news conference on Wednesday, Malaysian Transport and Defense Minister Hishammuddin Hussein said that a forensic team is trying to restore the files, which were deleted Feb. 3. Analysts say that they're likely looking for signs that Shad practiced unusual flight paths or landings in the run-up to the disappearance of Flight 370. Hishammuddin said that background information had been received on all passengers on board the flight, barring those from Russia and Ukraine, and so far nothing suspicious has been uncovered. He stressed that all on board should be considered innocent until proven otherwise. Hishammuddin also said that the Malaysian Chief of the Defense Force had been in contact with his counterpart in the Maldives, who confirmed that reports the plane had been sighted in the Maldives were untrue. The search area is now around 2.97 million square miles, roughly the size of the continental USA, with searchers from 26 countries contributing to the effort to find the missing aircraft and its 239 passengers. Search-and-rescue teams are focusing their efforts along two far-reaching arcs — one stretching up into the Asian landmass as far as Kazakhstan, the other reaching deep into the Indian Ocean — based on information from a satellite over the Indian Ocean. American officials believe the latter flight path is the most likely. This satellite last made electronic contact with the plane six hours after its final sighting on a Malaysian military radar. The Australian Maritime Safety Authority, which is coordinating the search along one portion of the arc in the southern Indian Ocean — off the western coast of Australia — has used new data analysis of the plane's suspected fuel consumption to cut its search area in half. The new area is around 89,000 square nautical miles, or roughly the size of Italy. Airborne searchers of the area have not spotted any signs of the aircraft, despite a clear view of the water. 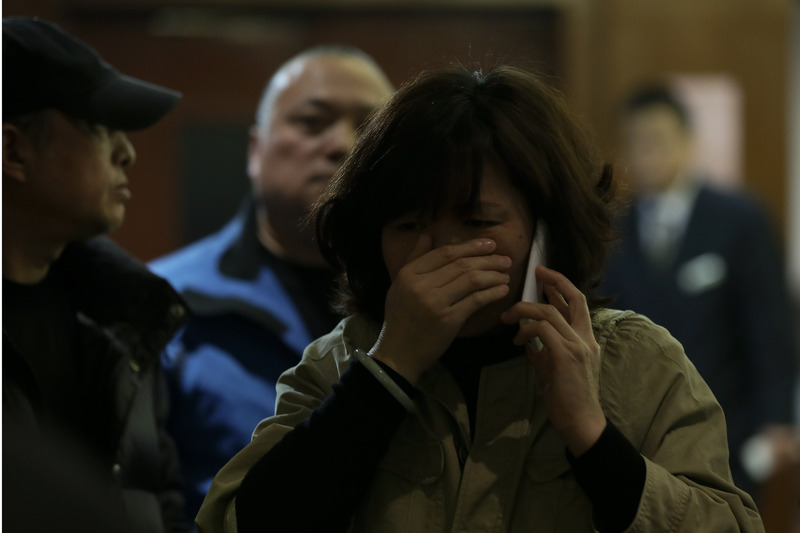 The search for the missing jet truly is a race against time, as the box on board the aircraft containing the flight data designed to keep sending out pings only has a battery life of 30 days. That leaves 18 days to track it down. The box, which also contains cockpit voice-recorders, could provide vital clues as to what went on in the hours after the jet went missing. Before Wednesday's news briefing began, a group of Chinese relatives of some of the passengers onboard the flight burst into the media room and unfurled a banner demanding the Malaysian government "tell the truth." The relatives, who were shouting and crying out, were protesting the slow and often contradictory flow of information both from the government and Malaysia Airlines. Malaysian officials have been facing mounting frustration over the way the situation has been handled. Many have criticized the Malaysian authorities for being slow to accept help from other nations. They have yet to respond to an offer of assistance from the Woods Hole Oceanographic Institute in Massachusetts, whose expertise in underwater searches led to the recovery of Air France Flight 447, the last major airliner that crashed into the sea, which disappeared over the Atlantic in 2009. However, authorities don't even know for sure whether the plane crashed — either into the sea or into land. There remains a slim chance it could have landed somewhere. However, U.S. officials are beginning to lean toward the assumption that the jet crashed somewhere in the Indian Ocean.